Patients who are considering taking Savella, also known as milnacipran, for the treatment of fibromyalgia should be aware of the many side effects and potential drug interactions associated with the use of this drug. Nausea, constipation and increased sweating are the most common side effects; these side effects may fade as your body becomes used to the medication. More serious Savella side effects, such as suicidal thoughts and behaviors, are concerning for some users. Savella has an array of common side effects that users may experience when first starting their Savella treatment. In clinical trials, nausea was found to be the most common Savella side effect; this side effect may be mitigated by taking your medication with a meal or snack. Most of these common side effects will fade on their own as the body adjusts to the medication. However, you should consult your doctor if the side effects become severe, or are bothersome and persistent. 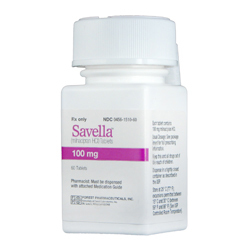 Severe Savella side effects require medical attention, as well as a consultation with the prescribing doctor. Although Savella is not used to treat depression, it belongs to the same class of medications and carries the same risk of suicidal thoughts and behaviors that is common to many antidepressant drugs. Patients under 24 years of age are particularly susceptible to these types of Savella side effects. While taking Savella, it is important to be mindful of any negative mood changes and report them to your doctor as soon as possible. Seek immediate medical attention if you are considering harming yourself. A large number of common, as well as potentially serious, side effects may deter some patients from using Savella to treat their fibromyalgia. However, Savella has helped many fibromyalgia sufferers find some relief from their chronic pain. Your doctor will weigh the benefits of Savella against its potential side effects before prescribing it.